The arrangement of atoms, ions, or molecules in a crystal. Crystals are solids having, in all three dimensions of space, a regular repeating internal unit of structure. Crystals are defined in terms of space, population, and mutual arrangement. Crystal space is represented as an indefinitely extended lattice of periodically repeating points. The periodicity of the lattice is defined by the lengths and mutual orientations of three lattice vectors that enclose the pattern. Population is defined as the total number and kind of fundamental units of structure that form the pattern. The order and periodicity of crystals must extend to about 100 nanometers in all three dimensions of space to give the sharply defined diffraction signals required for mapping structural details by x-rays. Intermediate states of order are seen in liquid crystals, which have long molecules as fundamental units of structure. These are arranged with their lengths parallel to each other, but without periodicity, in the nematic state. In the smectic state there is orientation in equally spaced planes but no sideways periodicity, like traffic moving freely on a multilane highway. A rectangular space lattice with two possible cells is outlined in the illustration. These have the same cell volumes but different symmetries. Since crystallographic unit cells are completely defined by three lattice vectors, the crystal symmetry referenced to this lattice can be no higher than orthorhombic: a ≠ b ≠ c (OA ≠ OB ≠ OC), and all angles equal to 90°. This and a possible monoclinic cell, with the same vectors a and b (OA and OB) and one angle not equal to 90°, are outlined. If the OAB plane is rotated and the vector a (OA) is extended to terminate at the next lattice point, then all angles differ from 90° and the crystal symmetry represented becomes triclinic. The mutual arrangement and atom coordinates of the cell population must be such that the environment, seen from every point of the space lattice, remains the same. Screw axes combine the rotation of an ordinary symmetry axis with a translation parallel to it and equal to a fraction of the unit distance in this direction. 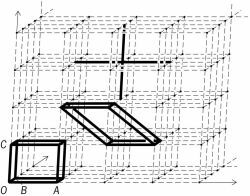 If screw axes are present in crystals, it is clear that the displacements involved are of the order of a few tenths of nanometer and that they cannot be distinguished macroscopically from ordinary symmetry axes. The same is true for glide mirror planes, which combine the mirror image with a translation parallel to the mirror plane over a distance that is half the unit distance in the glide direction. The handedness of screw axes is a very important feature of many biological and mineral structures. Space groups are indefinitely extended arrays of symmetry elements disposed on a space lattice. A space group acts as a three-dimensional kaleidoscope: An object submitted to its symmetry operations is multiplied and periodically repeated in such a way that it generates a number of interpenetrating identical space lattices. Space groups are denoted by the Hermann-Mauguin notation preceded by a letter indicating the Bravais lattice on which it is based. For example, P 212121 is an orthorhombic space group; the cell is primitive and three mutually perpendicular screw axes are the symmetry elements. J. D. H. Donnay and D. Harker have shown that it is possible to deduce the space group from a detailed study of the external morphology of crystals. In general, metallic structures are relatively simple, characterized by a close packing and a high degree of symmetry. Manganese, gallium, mercury, and one form of tungsten are exceptions. A characteristic of metallic structures is the frequent occurrence of allotropic forms; that is, the same metal can have two or more different structures which are most frequently stable in a different temperature range. The forces which link the atoms together in metallic crystals are nondirectional. This means that each atom tends to surround itself by as many others as possible. This results in a close packing, similar to that of spheres of equal radius, and yields three distinct systems: close-packed (face-centered) cubic, hexagonal close-packed, and body-centered cubic. Simple crystal structures are usually named after the compounds in which they were first discovered (diamond or zinc sulfide, cesium chloride, sodium chloride, and calcium fluoride). Many compounds of the types A+X- and A2+X2- have such structures. They are highly symmetrical, the unit cell is cubic, and the atoms or ions are disposed at the corners of the unit cell and at points having coordinates that are combinations of 0, 1, ½, or ¼. 1. Each ion can be assigned a definite radius. A positive ion is smaller than the corresponding atom and a negative ion is larger. 2. Each ion tends to surround itself by as many others as possible of the opposite sign because the binding forces are nondirectional. In the cesium chloride structure each of the centers of the positive and negative ions forms a primitive cubic lattice; the centers are mutually shifted. Contact of the ions of opposite sign here is along the cube diagonal. In the diamond structure, each atom is in the center of a tetrahedron formed by its nearest neighbors. The 4-coordination follows from the well-known bonds of the carbon atoms. The calcium fluoride structure is divided into eight equal cubelets, calcium ions are situated at corners and centers of the faces of the cell. The fluorine ions are at the centers of the eight cubelets. The crystal structure of an inorganic compound is the regular spacial arrangement of the atoms, ions, or, sometimes, molecules that make up the crystalline substance. The determination of crystal structures is one of the principal tasks of crystallography. Most inorganic compounds contain not molecules but interpenetrating arrays of cations and anions (seeCRYSTAL LATTICE). The simplest case is that of the structure of CsCl. Here, a primitive cubic lattice (seeBRAVAIS LATTICE) of Cl anions interpenetrates with a primitive cubic lattice of Cs cations. The lattices are positioned in such a way that each Cs cation is at the center of a cube formed by eight Cl anions, and each Cl anion is at the center of a cube formed by eight Cs cations (Figure 1, a). In other words, the coordination number is 8. Different substances often have practically identical structures (seeCRYSTAL CHEMISTRY). For example, the structure of CsCl is shared by CsBr, Csl, the thallium halides, and the ammonium halides. These compounds are all said to have the CsCl structure, or structure type. The structure type is one of the criteria for the similarity or difference of crystal structures. A structure type is usually named after a substance that crystallizes with the structure in question. A brief description of some of the most important structure types follows. with this structure include almost all the alkali halides (LiF, LiCl,. . ., NaF, NaCl,. . ., RbF, RbCl,. . .), the alkaline-earth oxides (such as MgO and CaO), and the important sulfide PbS. In the zinc blende (ZnS) structure, the zinc atoms and sulfur atoms each form a face-centered cubic lattice. This structure is characteristic of compounds with essentially covalent bonds. Compounds crystallizing with this structure include CuCl, Cul, HgS, and a number of important semiconductor compounds, such as CdS and GaAs (Figure 1, c). It is often useful to represent crystal structures in the form of polyhedrons. Here, the anions are represented by the vertex points of the coordination polyhedron (Figure 1, a, b, and c). This approach is based on the principle that the anions, which have larger ionic radii than do the cations, are preferentially arranged in accordance with a standard pattern of densest packing. Moreover, there are not very many anions (for example, 0, S, and F). Thus, in describing crystal structures it is sufficient to indicate merely the way in which the anions are arranged. The cations’ position and coordination number, which determine the characteristics of the crystal structure, are presented particularly clearly in this approach. BaTiO3 crystallizes with this structure. The cubic cell is deformed by the large Ba cations, which are located in the holes in the framework of Ti-centered octahedrons. The coordination number of the Ba cations is 12. The polyhedral representation also permits the description of complex structures, which are classified into groups according to the connectedness of the more strongly bonded units. Such a group includes all structure types in which the atoms or atomic polyhedrons are linked in the same way in space. Six principal groups of structures are distinguished: coordination structures, isolated units, rings, chains, sheets (layers), and frameworks. Coordination structures are characterized by a uniform distribution of interatomic bonds in three dimensions (Figure 1, a). Isolated-unit structures include structure types containing finite radicals, the bonds within which are considerably stronger than the bonds with the surrounding atoms. The radicals may be simple and have a linear shape (for example, S2, As2, Cl2, and S), a trigonal shape (for example, BO3 and CO3), or a tetrahedral shape (for example, SiO4, PO4, and BF4). Alternatively, the radicals may be complex and consist of two polyhedrons (for example, B2O5, Si2O7, and Ti2Cl9) or more complicated aggregates. In ring structures, atoms (such as S) or atomic polyhedrons (such as SO4 or PO4) are strongly bonded to each other in rings of various configurations; for example, the rings may have three, four, five, six, or nine members. Chain structures are characterized by a pronounced linear directedness of the strongest bonds in the structure—that is, by the linking of atoms (such as Se or Te) or of atomic polyhedrons (such as SiO4, BO4, PO4, BO3, TiO6, or ZrO6) in one dimension. The chains may be single or double—for example, and . More complicated shapes are also possible. In sheet structures, atoms or atomic polyhedrons are linked in two dimensions in infinite nets. This structure is characteristic of micas and mica-like layer silicates. Sheet structures are also encountered in, for example, graphite, molybdenite (MoS2), and covellite (Cu2CuS2S). Framework structures, like coordination structures, exhibit a uniform distribution of bonds in space, but the shared elements of the atomic polyhedrons are, for the most part, the vertices. This fact accounts for the great looseness of these structures, the holes in which are occupied by large cations. The polyhedrons are usually tetrahedrons (for example, SiO4, PO4, BO4, and A1O4) or octahedrons (for example, MoO6 and WO6). Isolated-unit, ring, chain, sheet, and framework structures are especially characteristic of silicates and aluminosilicates. The principal role in such substances is played not by simple mona-tomic anions but by the tetrahedral SiO4 group. 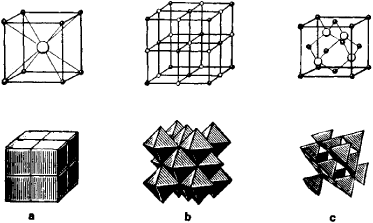 In most silicates, this elementary silicate “building block” forms either rings or infinite radicals in one, two, or three dimensions (see Figure 1 in SILICATE). Belov, N. V. Struklura ionnykh kristallov i metallicheskikh faz. Moscow, 1947. Belov, N. V. “Ocherki po strukturnoi mineralogii.” In Mineralogicheskiisbornik. Lvov, 1950–75. The arrangement of atoms or ions in a crystalline solid.